Pilates is a full body exercise system that enhances body, mind, and spirit. It is a program for a lifetime that helps return the body to health. You can begin at any age, you neither have to be flexible or fit, nor do you need prior experience. Through Pilates you acquire control of your body and through proper repetition of the exercises you gain a natural rhythm, coordination, and strength that translates into all your daily activities. Pilates is not a fatiguing system of dull, boring exercises repeated over and over. It does not produce bulging muscles from haphazard exercises. It teaches your body how to get along. There are no bully muscles, only a system of muscles, tendons and ligaments working together to create inner and outer peace in body and mind. Alleviate back pain. Strengthen your core. Teach you how to fully access your breath. Correct compromised postures. Improve flexibility and coordination. Help prevent / rehabilitate injuries and reduce chronic pain. Restore physical vitality. Invigorate the mind and elevate the spirit. A: A full body workout system that strengthens, lengthens and tones your whole body designed by Joseph Pilates. This system is intended to strengthen both body and mind. Q: I'm not flexible, can I do Pilates? A: Yes. Absolutely. There is no requirement to be flexible. Pilates will make you more flexible in both body and mind. A: Wear comfortable clothing that you would wear to either the gym or a yoga class. The tighter the clothes the better we can see your body. We are looking at your alignment, the more we can see the better. A: All cancelations for all classes must be made within 24 hours of the class time or you will be charged in full for the class. A: No! Just bring yourself, comfortable clothes and bare feet or socks. You won't need your sneakers. We provide all mats and we have water available in the studio. Q: If I have an injury can I sign up for a group class? A: We recommend that you come for a private lesson if you are nursing an injury. If you have clearance from your doctor, you can sign up for a group class but please let us know what your injury is and be mindful to take it easy. A: Yes, we accept cash and all major credit cards. 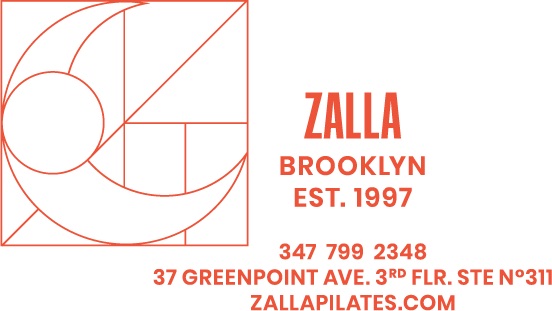 Please email info@zallapilates.com and we will get right back to you! "I won’t go to any other studio. "I have become so strong thanks to you! Thank you, thank you, for the journey, the new body, the new me!"